Keeping your dog’s ears free from moisture and bacteria is an important step in your regular grooming schedule. 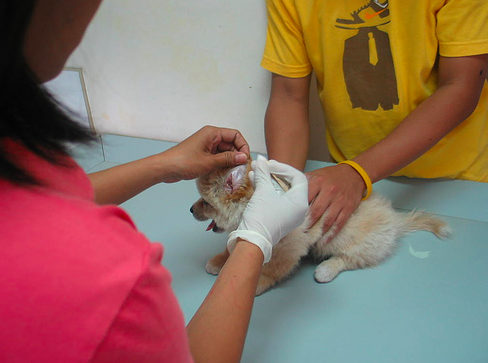 During hot summer months, and swimming season, you might be checking and cleaning your dog’s ears weekly or even daily. Think of your dog’s ears as a hot and moist petri dish for bacteria to flourish and grow. Think that’s gross? Try taking a whiff of the waxy brown stuff that you clean out. Yuck! Here’s a few tips to keeping your dog’s ears clean. This is the most important aspect of keeping your dog’s ears clean and healthy. It doesn’t take long (a few days) for a little moisture to grow into a full blown problem. 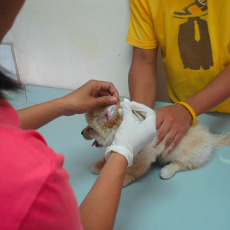 Your dog might scratch at his ears, causing infection and another problem to add to the list. Moisture is usually the culprit. Simply swabbing inside of your dog’s ears with a cotton ball daily can help absorb anything moisture that crept in. It will also indicate if there is a need to clean deeper. Trim Hair Growing into the Ear. Especially important for harrier breeds, poodles and terriers. Hair can trap moisture and result in helping the petri dish environment flourish. Gently wipe inside of your dog’s ears. Diluted tea tree oil applied to the cloth is a wonderful antibacterial that will help prevent future build up. Shaking of the head and scratching of the ears is NOT normal for dogs. If you see your dog exhibiting this kind of behavior, inspect thoroughly, as ear infections are extremely uncomfortable and can eventually lead to deafness. Also, remember, the more often you clean and check your dog’s ears, the less gross the job is!